For the fourth straight year, more Morris Sperry lawyers attended the largest and most important HOA law seminar in the nation than any other Utah law firm. Six lawyers from Morris Sperry spent four days in seminars on topics such as drones, hot HOA topics, amending governing documents, pets in HOAs, fiduciary duties, and several other community association topics. The law seminar put on by the College of Community Association Lawyers is the best opportunity for serious HOA lawyers to talk about HOA issues and strategies with hundreds of lawyers from around the country focused in this complex area of law. Morris Sperry lawyers attending and presenting at this seminar fine tune cutting edge strategies and ideas for inclusion in new governing documents and implementation throughout their practice. Morris Sperry invests in this training because they remain the only law firm in Utah focused exclusively on representing associations, owners, and developers in the complex area of community association law (condominiums, HOAs, townhomes, PUDS, and homeowner associations). Who do you want representing your condominium, townhome, or HOA, the lawyer who spends part of their time on HOA law or the lawyers at Morris Sperry who invest the time and effort to stay on the cutting edge of legal issues in the complex area of community association law? John Morris of Morris Sperry took time out of his busy schedule to visit Ms. Peck's class at McMillan elementary school to talk about the judicial system and put on a mock trial in which the students participated. With a prosecutor, judge, jury, defense lawyer, and multiple witnesses, the children all played their parts and had a great time. Morris Sperry lawyers are always looking for a way to participate in the community. John Holland, the founder of Property Management Systems Inc., passed away May 17, 2016. Anyone who had the privilege of meeting John remembered him as a kind and thoughtful man who always made anyone he was speaking with feel special. He built a very successful property management business on hard work and his ability to build relationships. John and his son Joe introduced John Morris of Morris Sperry into the HOA world. Fresh out of law school, John Morris served on the board of his condominium association that Property Management Systems managed. After getting to know one another, Joe asked John Morris to help him with another association's legal issues. The rest is history as John Morris's practice included more and more HOA work until it become his sole focus. This culminated in the founding of Morris Sperry, the only law firm in Utah focused on HOA law. Joe and John Morris are still friends and still working together to solve problems for HOAs. John Holland was a good man and he will be missed by his family, his employees, and those in the property management industry. We offer our deepest condolences from the lawyers and staff at Morris Sperry. For the third straight year, more Morris Sperry lawyers attended the largest and most important HOA law seminar in the nation than any other Utah law firm. Five lawyers from Morris Sperry spent four days in seminars on topics such as aging communities, hot HOA topics, amending governing documents, pets in HOAs, plats, and several other community association topics. The law seminar put on by the College of Community Association Lawyers is the best opportunity for serious HOA lawyers to talk about HOA issues and strategies with hundreds of lawyers from around the country focused in this complex area of law. Morris Sperry lawyers attending and presenting at this seminar fine tune cutting edge strategies and ideas for inclusion in new governing documents and implementation throughout their practice. Morris Sperry can invest in this training because they remain the only law firm in Utah focused exclusively on representing associations, owners, and developers in the complex area of community association law (condominiums, HOAs, townhomes, PUDS, and homeowner associations). Who do you want representing your condominium, townhome, or HOA, the "jack of all trades" lawyer who would never invest the time in a seminar like this or the lawyers at Morris Sperry who invest the time and effort to stay on the cutting edge of legal issues impacting your assocaition? A Virginia association recently received an application from an eleven-year-old boy for an open board position. The bylaws and declaration don't have any minimum age requirements. The Association has engaged counsel and is scrambling to figure out if they must accept the application and put the boy on the ballot for the election. The application raises all sorts of interesting issues including whether a child with no capacity to enter into a contract can nonetheless vote on a board and make decisions. Practically, of course, it seems that an association who elects an eleven-year-old to the board deserves what they get! This funny example highlights the never-ending questions that can arise in the context of board elections. The Association is taking the right step in seeking legal advice to resolve this issue before an annual meeting and before an election dispute turns into something more serious. Morris Sperry attorneys can turn around these types of questions quickly and efficiently to keep associations on track with their board elections. As Americans, we love our country and those men and women, past and present, who serve and sacrifice for our freedoms. Displaying the Flag of the United States is one way we show our patriotism to honor our nation and the heroes that make this country great. Recently, the right to fly our nation’s Flag within homeowners associations (each an “HOA”) has stirred some controversy here in our state. When news broke that an HOA in the Salt Lake Valley wanted to restrict its residents from flying Old Glory, owners of that HOA and many others expressed their outrage. It is likely that no other symbol evokes more emotion and patriotism than the Stars and Stripes. So if you are an owner or resident in an HOA, what are your rights when it comes to flying the American Flag? When a person purchases a home in an HOA (a condo, townhome, or detached home), that person becomes a member of the HOA and agrees to adhere to the HOA’s particular covenants, conditions, and restrictions (the “CC&Rs”). Courts interpret CC&Rs as legally binding contracts between the owners and the HOA. This is why it’s so important for owners or prospective purchasers to review the HOA’s CC&Rs so they understand the covenants or restrictions that may apply to the use of their property and the HOA’s common property within the HOA’s boundaries. Due to the complex nature of CC&Rs, owners in HOAs sometimes fail to properly understand the restrictions they agree to when purchasing their home or fail to see the many benefits HOA living brings with it. While some HOA rights are apparent, other rights have been misunderstood. Some people feel that an HOA restricting the location where a Flag is flown is a restriction on freedom of speech and the property rights we as Americans hold so dear. However, this is not always the case. 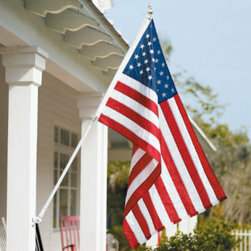 A quick reading of this section may suggest that an HOA may not restrict an owner’s right to display the Flag at all. However, the key issue to focus on in this scenario is the location where an owner is attempting to display the Flag. If the owner has “exclusive possession or use” of an area then the HOA cannot restrict or prevent Flag displays in that area. The HOA, however, can restrict Flag flying in the common areas. The CC&Rs and plats for each HOA identify those sections of an owner’s dwelling or lot that are owned exclusively by the owner and those areas over which the owner has the exclusive right to use or possess. The HOA’s CC&Rs further identify the common areas of the HOA. In a condominium project, the common areas are owned collectively by all owners and may include areas such as the clubhouse or pool area, landscaping surrounding condos, and building features (siding, roofs, eaves, etc.). In other community association developments (non-condominium projects), the common areas are owned by the HOA itself. Thus, the common areas in HOAs are not owned by any one owner and there is no “separate ownership interest” in the common areas for a particular owner. Moreover, the CC&Rs generally provide that all owners of the HOA have a right to use and enjoy the common areas, which means that no individual owner has the “right to exclusive possession or use” of these common areas. These common areas, therefore, fall outside the scope of section 3 of the Freedom to Display the American Flag Act of 2005, and an HOA may regulate or even prohibit the display of the Flag on its common areas. (c) from a staff, pole, or window. As explained above, an owner or resident of a condominium association does not have “exclusive control” over common areas within his or her HOA; therefore, a condominium association may restrict or prevent an owner or resident from displaying the Flag in common areas. On the other hand, CC&Rs typically define the interior sides of windows in condominium projects as being under the resident’s “exclusive control”; thus, an HOA could not prohibit the resident from displaying the Flag in a window. An association may not prohibit a lot owner from displaying a United States flag inside a dwelling or limited common area or on a lot, if the display complies with United States Code, Title 4, Chapter 1, The Flag. An association may restrict the display of a flag on the common areas. Federal law allows an HOA to adopt “any reasonable restriction pertaining to the time, place, manner of displaying the Flag of the United States necessary to protect a substantial interest of the condominium association, cooperative association, or residential real estate management association.”  One example of a valid time, place, and manner restriction could apply to illuminating the Flag for display at night. “[I]t might be appropriate to restrict large flood lights that illuminate the flag because it disturbs the ability of neighbors to sleep.” An HOA may require that the Flag be properly displayed per the Federal Flag Act. We all hope that someone displaying or using the Flag does so in a manner that is proper and respectful to the Flag but, just in case, an HOA may require that the individual correct his/her actions so that the Flag is properly displayed. One must keep in mind that even though an HOA has the right to restrict the display of the American Flag on common area, the HOA may take the position that it wants its owners and residents to fly the Flag in the common areas. An HOA may choose to amend its CC&Rs (in accordance with its particular amendment procedures) and specifically allow owners to display the American Flag in certain common areas. Such an amendment may contain guidelines concerning the location and manner that flag poles or other devices may be installed on the common areas to minimize the potential for future damages (i.e. water penetration through the holes) while still allowing residents to express their patriotism and respecting a person’s right to fly that Star Spangled Banner. It is important to note that while many view HOAs in a negative light, these people limit their focus and perspective to only certain restrictions imposed by the HOA. It is true that when individuals live in an HOA, they are essentially entering into a contract with their neighbors and, by entering into that contract, the owners may give up some of their rights that may otherwise accompany traditional homeownership (outside of an HOA); however, these individuals in an HOA gain protections and rights too. Some of the use restrictions that may limit traditional property rights concern: colors used on the exterior of a home, materials and colors used when installing a fence, types of plants or trees an owner may have in his/her yard, smoking tobacco products in or around a dwelling, and the number or type of pets an owner may have, whether an owner may rent their property. Viewed from another perspective, these restrictions grant owners the right to protect themselves from breathing secondhand smoke and to maintain uniformity in the quality of craftsmanship, landscaping, and level of building and landscaping maintenance all of which preserve property values. An HOA’s CC&Rs further afford owners the right to elect members of their HOA’s governing board, approve their HOA’s budget, and ratify proposed amendments to their HOA’s CC&Rs. In conclusion, living in an HOA does not strip individuals of their Constitutional, federal, and/or state law rights when it comes to issues such as displaying the American Flag. By living in an HOA, individuals agree to adhere to further statutory and contractual provisions intended to promote the health, safety, and welfare of the community residents, maintain a sense of community, and preserve owners’ property values. **This article originally appeared on the Utah Chapter of the Community Associations Institute blog on Nov. 11, 2015. Utah Code Ann. § 57-24-101(3). Utah Code Ann. § 57-24-102(1). Utah Code Ann. § 57-8a-101 et seq. Utah Code Ann. § 57-8-1 et seq., applies to condominium projects. See Section 4 of the Freedom to Display the American Flag Act of 2005. See Guidance for Complying with the Freedom to Display the American Flag Act of 2005, Community Associations Institute, available at http://www.caionline.org/govt/news/Pages/GuidanceforComplyingwiththeFreedomtoDisplaytheAmericanFlagActof2005.aspx. In a free webinar put on by Utah CAI, John Morris introduced a new Utah HOA mediation program that he spearheaded and that members of the local CAI chapter have been working on for more than two years. This will be a great opportunity to cost effectively resolve disputes involving HOAs. Associations, board members, homeowners, and vendors in homeowners associations can now take advantage of this program and low cost mediators experienced in HOA matters that the program will offer. This is a great option for resolving disputes before people are forced to spend money on lawyers and lawsuits. Morris Sperry is proud to have guided the development of this program for the benefit of all homeowners and associations in Utah. News Seeks Out Morris Sperry for Opinion on Flying U.S. Flag in HOAs. Quinn Sperry of Morris Sperry was interviewed on the news last week about a serious controversy in a Utah HOA. Residents want to fly the American flag and the association board is sending them fines and wants the flags removed. This problem repeats around the country when HOAs take harsh positions on flying the flag inside the community. No symbol evokes more emotion, patriotism, and willingness to fight an HOA than the stars and stripes. Morris Sperry regularly advises both owners in communities and community associations (HOAs, condominiums, townhomes, and homeowners associations) about flying the flag of the United States of America. There is an absolute legal right to fly the American flag from or on certain property owned or under the exclusive use of the homeowner and with certain legal requirements. Working with Morris Sperry and taking advantage of our experience and knowledge with this issue, associations can make and enforce reasonable requirements for flying of the American flag while allowing owners to express their patriotism and while respecting their legal right to fly the flag. More importantly, with the wise counsel of Morris Sperry, associations and owners can avoid the media circus and hostility created by the association that was the subject of this story. Amy Binns-Shewan has joined Morris Sperry as an associate attorney. Amy excelled in law school, graduating in the top of her class. She graduated with honors and was invited to join the Order of the Coif. She served on the Utah Law Review and received several distinctions for excellent performance in law school. Amy is excited to focus on community association law and is looking forward to immersing herself in this complicated area of law. Amy contributes to the depth of excellent lawyers at Morris Sperry, allowing the firm to get work done (and done well) for our clients. Morris Sperry is excited to add excellent lawyers like Amy and will continue to grow and add lawyers as necessary to provide excellent and timely legal services to Utah condominiums, HOAs, homeowner associations, and community associations.